I'm guessing by the flourish of the letters and by some of the sentiments, that the author is a woman. Right or wrong, though, the author is She to me, and so she will be She as I write about Her for you. 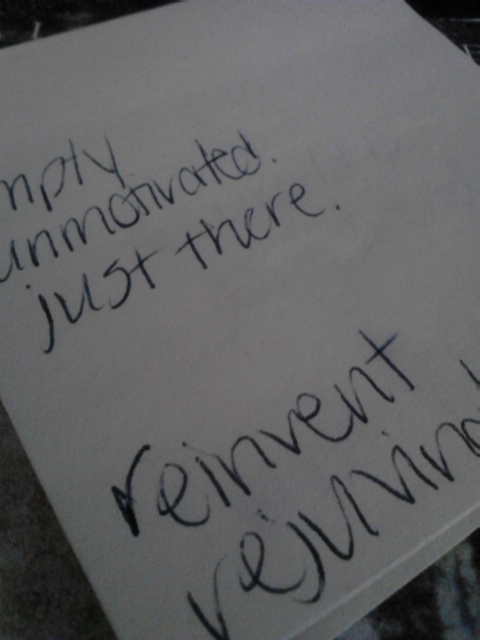 Post-it #1: "empty. unmotivated. just there. reinvent. rejuvenate." 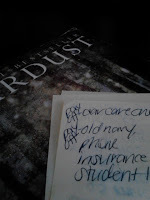 At first I wondered if She was writing definitions of words she hadn't grokked when reading. That was just from a cursory glance when the post-its fell out of the book. Later, though, when I really read the words, I wanted to hug her. The first three are statements of presumed fact. Status indicators. 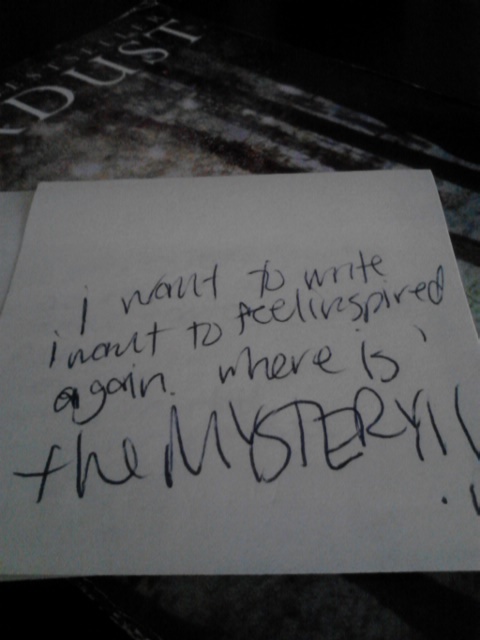 The last two are requests and wishes scrawled onto paper. Post-it #2: "The world is going to end soon. I want you!" I love this one. It's rich and full of potential. Did She leave it on her lover's desk? Is it something She wrote, intending to give it to someone she's pined for over the years, but then failed to out of fear? There are so many stories buried in this one little post-it that I salivate to hear them all. Curiosity makes me stare at it, as if I can look deep into the fibers of the paper and watch the ink spin into some portent, as if I can divine what happened. Post-it #3: "I want to write. I want to feel inspired again. Where is THE MYSTERY!!!!" Oh, preach it, sister! I've been there. Haven't we all been there? Who hasn't punched the steering wheel or just let out a growl of frustration that has nothing to do with traffic because life just seems flat and dull? We want to be quickened, we want to be pushed and moved and find something in life worth the wonder. 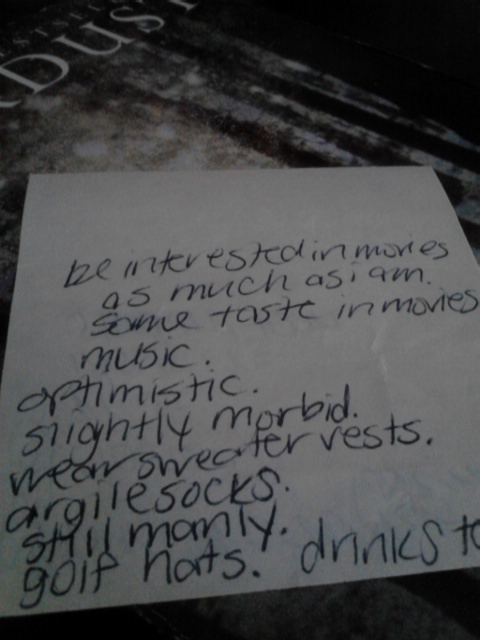 Post-it #4 (front:): "be interested in movies as much as i am. same taste in movies/music. optimistic. slightly morbid. wear sweater vests. argile socks. still manly. golf hats. drinks tea." A description of a character in a book? Of someone She knows? Or a wish list for someone She has yet to meet? 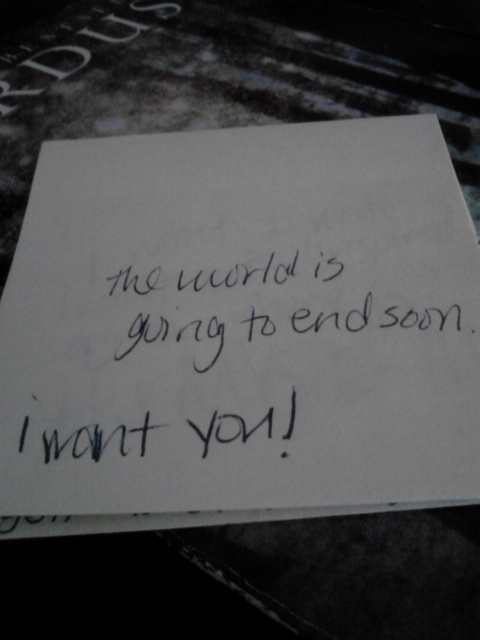 This one, I think, is the one that truly sets the tone of the post-its... they're all wishes. They're all pleas to the universe. She wants her world to thrive and bloom, she seeks a companion to share it... She wants. She needs. There is desperation and need in every stroke of her pen. 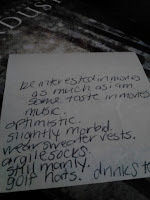 When I shared this note with my mother, she said, "I hope She found him." Meanwhile, my husband's reaction was, "She probably met someone who made her toes curl...but he was nothing like that." 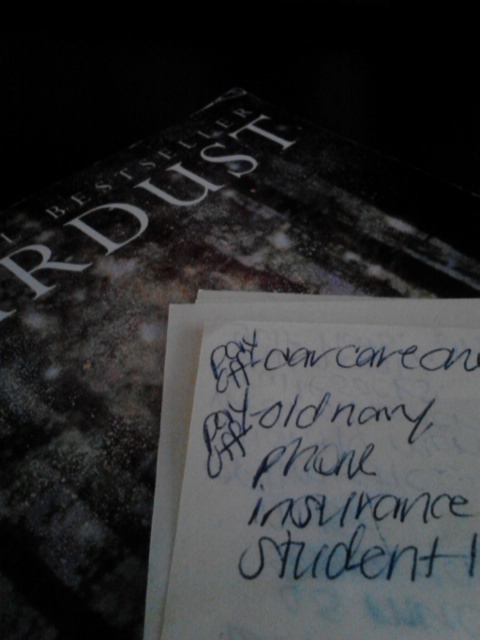 Post-it #4 (back): "pay off car care one (for saturn). pay off old navy. phone. insurance. student loan." And then, the wishes are over. We have practical goals. Money worries. Ducks are being put into neat little rows. This one makes me saddest of all. Flip over your dreams, your soul's own desires, and get back to the "real world" and focus on what's important. And then, She stuffed the notes into a book. Or maybe the notes and the book shared a bag for a while and one thing led to the other... and then the book ended up at a used bookstore for trade credit or a bit of cash to pay off that Old Navy card. I wonder if She got what she needed. Did She meet Mr. Sweater Vest and sip tea with him, making new stories and memories that shift her soul? Did she give up the book with its packet of wishes because they all came true? Or does she still wait for a reply? Either way, it's the perfect book in which to send your dreams sailing. Here's hoping this star was lucky for her.